Robert S. Gold, M.D., F.A.A.P. Louis C. Blumenfeld, M.D., F.A.A.P. Rebecca J. Adams, M.D., F.A.A.P. Robert W. Hered, M.D., F.A.A.P. Eye Physicians of Central Florida is proud to provide excellence in modern cataract surgery with two skilled and experienced ophthalmic surgeons – David B. Auerbach, D.O. and Victor B. Thomas, M.D. Our doctors are now offering Bladeless Laser Assisted Cataract Surgery with Alcon's LenSx® laser. Our advanced laser system is designed to deliver the best visual results with unsurpassed precision and accuracy. More than half of Americans age 65 and older have a cataract, and it is thought that nearly everyone will develop one if they live long enough. The total number of people who will have cataracts is estimated to rise to more than 30 million by 2020. A cataract is a clouding of the normally clear lens of the eye. The lens is responsible for focusing light rays on the retina at the back of the eye to produce a sharp image of what we see. When the lens becomes cloudy, the light rays cannot pass easily through it, and the image becomes blurry. Cataracts usually develop as part of the aging process but can also come from eye injuries, systemic diseases, certain medications and genetic inheritance. The good news is cataracts are correctable. If your vision is only a little blurry, the cataract may need no treatment at all. Sometimes changing your eyeglass prescription may improve your vision for awhile. However, if a change in eyeglasses does not help, you may need cataract surgery. There are no medications, eye drops, exercises or glasses that will cause cataracts to disappear once they have formed. When you are not able to see well enough to do the things you like to do, cataract surgery should be considered. It is the only way to remove a cataract. How do I know I have a cataract? Common cataract symptoms include increasingly blurred vision, halos around light, glare, difficulty seeing at night, double vision, and reduced color perception. Almost everyone has at least some form of clouding in the lens of the eye over the age of 70, but diabetes, heart disease, or history of eye trauma or eye surgery may speed up the clouding process of the lens. 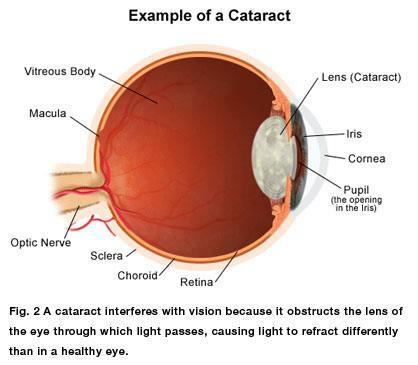 Cataracts do not cause pain or discomfort. Also, cataracts do not cause intermittent vision blurring. To be certain, however, it is recommended you have a complete eye examination by an ophthalmologist or optometrist. If you are interested in learning more about cataract surgery, schedule an appointment with Eye Physicians of Central Florida, serving the people of Orlando, Maitland, Winter Park, Oviedo, Lake Mary, Heathrow, MetroWest, Kissimmee and more. Serving Central Florida areas not exclusive to Orlando, Maitland, MetroWest, Winter Park, Lake Mary, Oviedo. All Rights Reserved. Copyright © 2018. Eye Physicians of Central Florida.